Remove the screws from the rear wheelhouse liners to the rear fascia. Refer to Rear Wheelhouse Liner Replacement. Disconnect the rear electrical connectors. Carefully push a small nylon wedge between the fascia and the bracket to separate the joint slightly. Spray a mixture of soap and clean drinkable water into the joint, to act as a lubricant. Insert a small flat-bladed tool or plastic trim tool into the fascia slot and depress the tabs one at a time. 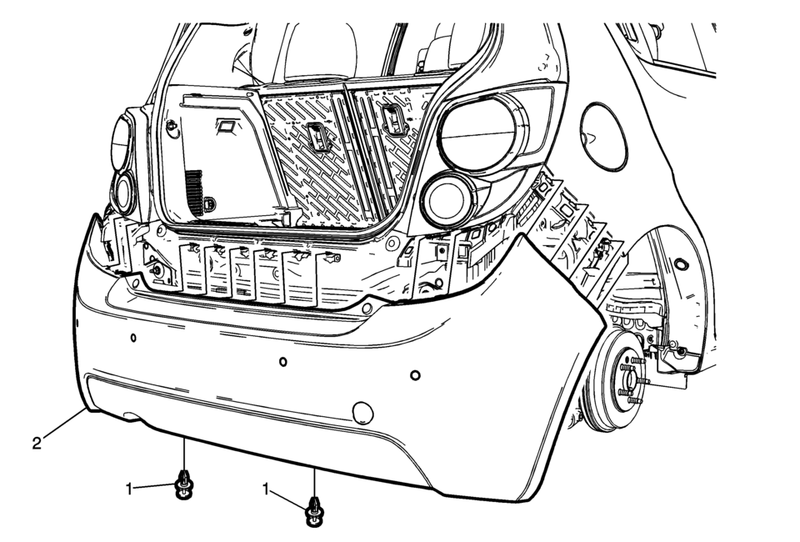 Pull the rear bumper fascia carefully rearward and outward in order to release the retaining tabs from the rear bumper fascia guides.